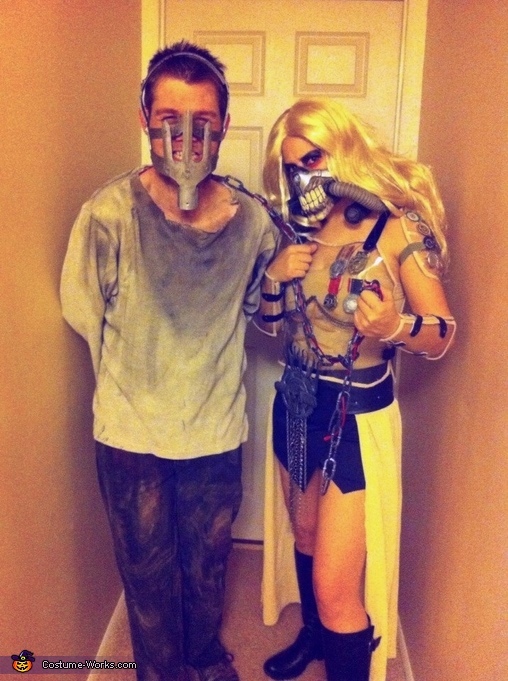 I'm wearing max, Beth is wearing Immortan Joe. The first picture shows her entire costume. Max was a custom made foam mask lined with moleskin, painted with metallic paint. Immortan joe was... alot of work! Head to toe rundown... The mask was hand sculpted and molded in plastic, Beth hand painted it. I hand stitched the bellow out of vinyl, traced the shape off of a basketball contour. I attached 2 lawn mower filters painted to give them petina. The gas mask tubes were from a soviet childs xl gas mask. After taking a full body plaster cast, The chest piece, back piece, shoulders and forearms were custom fitted. We used a heat gun to stretch 1/8" plexi over the plaster forms. The medals were all hand carved otu of hobby foam. The bottle caps were secured with jump rings and attached to the shoulder. To attach all of the plexiglass we used black vinyl, a decorative rivet on each side and velcro. The chains and medals were attached by drilling small holes into the chest piece and using rivets for the medals, black wire for the chains. The belt was made out of black vinyl with sheer tan fabric attached. The cod piece was removable via hooks in the back and it was made out of real chains and hobby foam. The paint job on the Joe mask is incredible!